Mipalloy is a three decade old manufacturing company in the line of copper & copper alloys. Mipalloy is among India's most reputed names in the line of copper alloys. All our products are considered the bench mark for quality in their respective lines. Inspite of being a company rich in tradition our factories are contemporary with state-of-art production lines rich in cutting edge technology. Mipalloy is a company where our team is a harmonious blend of young & experienced people. Though our chief executive has over 50 years experience in the field. Our average age of our employees is 32 years. Our true strength is in our team of human resources who are dynamic & well experienced. Mipalloy has over 35 engineers in various disciplines on rolls with equally qualified supporting staff in well demarcated departments of finance, materials management, projects, logistics, imports & exports. All departments working in tandem to ensure our customer receives high tech products with world class service when they need them at cost effective prices. Mipalloy has three world class factories located in & around Chennai. With easy access to international airport & seaport at Chennai. Our customers are ensured timely deliveries of our products at low shipping costs. Apart from our centralized sales team in Chennai we have offices in Pune, New Delhi, Bhilai & Ahmedabad to offer our customer necessary techno commercial support. All enquiries / request for quotations can be forwarded to mipalloy@md3.vsnl.net.in for a swift response. Mipalloy recognizes that time is the essence of every contract & our logistics team ensures that our product is safely handed over to you or your authorized forwarder/agent in suitable packaging to ensure intact transshipment. Mipalloy has a dedicated fleet of trucks to ensure swift delivery of manufactured materials to your forwarders ware house. All information on despatches can be obtained by enquiring logistics@mipalloy.com. EDM Electrodes in Tungsten Copper. 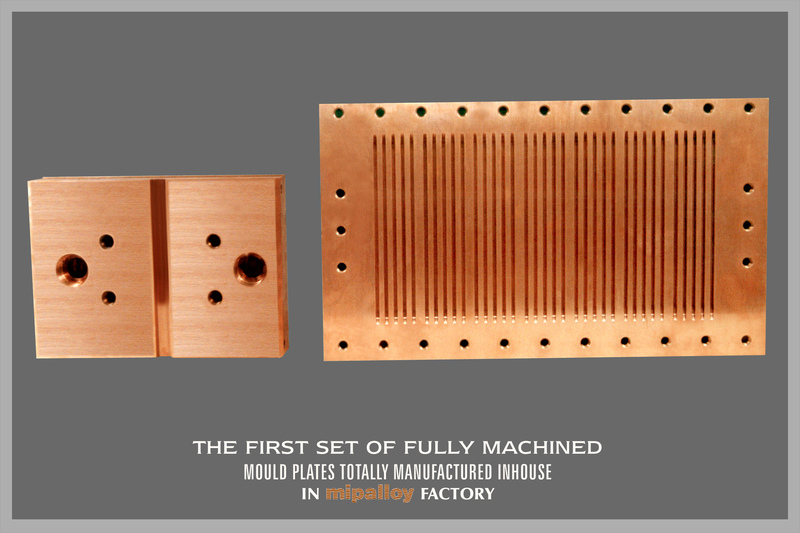 Copper & Copper Alloy Plates & Sheets. This division of ours has a rod mill which produces bar stock in round, flat, square, hexagon & other shapes for downstream requirements to make resistance welding products. We are equipped with heat treatment furnaces tunnel type, bogie hearth type & fork type to heat treat single pieces weighing up to 3000 kgs. A wide range Vertical Machining Center's right from small ones to produce small parts of 10 x 10 x 10 mm to large Vertical Machining Center's capable of accommodating parts weighing upto 5000 kgs & measuring 2500 x 1500 x 1000 mm. Our CAM (Computer Aided Manufacturing) facility ensures that complicated part programming is done by suitable software & fed into CNC controls to ensure production of complicated profiles. We possess a press shop with various hydraulic presses right from 25 MT to 200 MT to make bent holders & arms for spot welding guns. We manufacture spot welding caps by cold forging & have SPM’s to make cold headed caps. We are the only Indian company to make caps by cold forging. We have gun drilling equipment which for example can drill deep holes of Ø12 x 1500 mm long. A large variety of sizes are possible & you may enquire for details. We have induction brazing facility to braze W.Cu. inserts on to Cr.Zr.Cu. or Be.Cu. supports. We make resistance welding products like caps, shanks, holders, screw adaptors, seam welder wheels. We make seam welding wheels by completely forging oxygen free Cr.Zr.Cu. & N. Si.Cr.Cu billets. This division has state-of-art equipment to manufacture continuous casting mould plates for steel plants & non ferrous mills. We have the exclusive tie up with our partners in Germany who supply us cold rolled plates in Ag, Cu & Cr, Zr, Cu. We have the facility to process plates of dimensions upto 150 mm thick x 1500 mm wide x 2500 mm long. We have band saws which can saw 400 mm x 2000 mm cross section. We possess a wide range of Vertical Machining Center's including large double column Vertical Machining Center's with HPCC (High Precision Contour Control) & runs on Fanuc 18 i MB. Our double column VMC’s can handle jobs upto 5000 kgs measuring even 2500 x 1500 x 1000 mm. A specialty of this division of ours is our capability to gun drill deep holes of 1500 mm long. We regularly drill general types of deep holes like Ø14 x 1500 mm. This division of ours has heavy duty robust conventional & CNC turning center's capable of turning jobs upto Ø660 x 2000 mm long. This division of ours has a large number of vertical machines like VMC’s conventional milling machines & large capacity bed milling machines to ensure fast turn around of moulds. We have among the largest size CMM’s in the industry capable of measuring 1000 x 1500 x 2500 mm. This division has a atmosphere controlled standards room with sophisticated measuring instruments & gauges for metrology hardness inspection, conductivity inspection & ultrasonic testing. This division makes Medium voltage, High voltage and Extreme high voltage switch gear contacts. Though this unit principally manufactures tungsten copper contacts, materials of construction include Copper, Silver copper, Chromium Copper, Chromium Zirconium Copper, Brass & Steel. This division has sophisticated equipment to cater to the exacting requirements of the power transmission industry. We have ball mills & powder blending equipment. Special purpose hydraulic equipment (SPM’s) for compaction. Low temperature H2 atmosphere furnaces for pre-sintering. As Tungsten Copper is manufactured by the powder metallurgy route. The process equipment of this division is PM equipment. High temperature H2 atmosphere furnaces for sintering. CNC lathes & VMC’s for machining. Electron beam welding machine proposed to be added in near future. Sophisticated standards room available with CMM & Reverse engineering capability. This division makes plastic moulds in Ni.S.Cr.Cu., 0.55% Be.Cu. & 2% Be.Cu. Hot forging facility available to open forge billets of Ni.Si.C.Cu., 0.55% Be.Cu. & 2% Be.Cu. into rounds, squares, rectangles & shapes. Near net shape processing reduces costs & hot forging improves micro structure & product quality. Heat treatment facility avail to heat treat all plastic mould materials. Wide range of sawing & machining capability avail to supply materials in either proof machined condition or fully machined condition. Since sophisticated VMC’s are available customers can design plastic moulds & provide CAM machining data by way of flash memory card or PCMCIA card & we can undertake complicated machining thus lead time for customer who has to only assemble the moulds or inserts. Large stocks of Ni.S.Cr.Cu., 0.55% Be.Cu. & 2%Be.Cu avail at our end to offer ex-stock deliveries for most requirements. Mipalloy manufactures plunger tips in Ni Si Cr Cu, 0.55% Be.Cu. & 2% Be.Cu. and has sophisticated equipment to deliver the highest quality plunger tips. We are among the few companies in the world capable of making the largest size plunger viz. Ø 300 mm plunger. We possess heat treatment equipment to heat treat Nickel Silicon Chromium Copper. Nickel Silicon Chromium Copper, 0.55% Beryllium Copper & 2% Beryllium copper. We have CNC lathes capable of turning even Ø300 mm plunger tips. Automobile (Passenger cars, trucks, buses, motor cycles, scooters & earth moving equipment) industry. Auto comp industry manufacturing shock absorbers, wheels, brakes, steering systems, fuel tanks, sheet metal sub assemblies, auto electricals & fuel injection equipment. Drums & Barrels manufacturing industry. Steel plants & non-ferrous mills. Electrical Medium voltage, High voltage, Extreme high voltage in S/G Industry. On load tap changer manufacturing industry. Tool rooms & tools/dies/moulds manufacturing Industry.